The idea behind Vedette's madness could be summarized as a mix between minimal Hip-Hop ala Anticon and a cellar full of toys ! 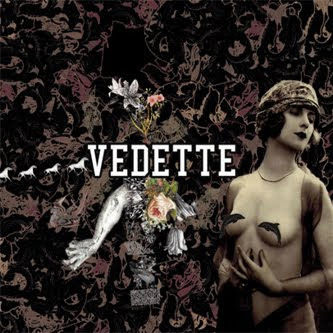 The songs on Vedette's self-titled album are disturbed collages of dirty experimental hip-hop (a la CLOUDDEAD), illuminated like stained glass by vividly poetic lyrical rays.Their debut album takes root in the muddy earth of neo-deconstructed pop, where XIU XIU serenely intertwines with CAPTAIN BEEFHEART. Vocalist Neil Carlill was a founding member of DELICATESSEN and Manuel Stagars is a composer, artist and producer who has recorded many experimental/ambient albums and participated in Art Installations in Europe and America.